Husband, you have outdone yourself with this one. I came home from yoga last night to his latest invention: Henry’s Spicy Chimichurri, along with some grass-fed steaks on the grill and an amazing salad! Combine all ingredients in a mixing bowl and blend with a hand-held blender. If you have a food processor feel free to use that instead your call, and both work. This makes 32 tablespoon servings at 32 calories each. 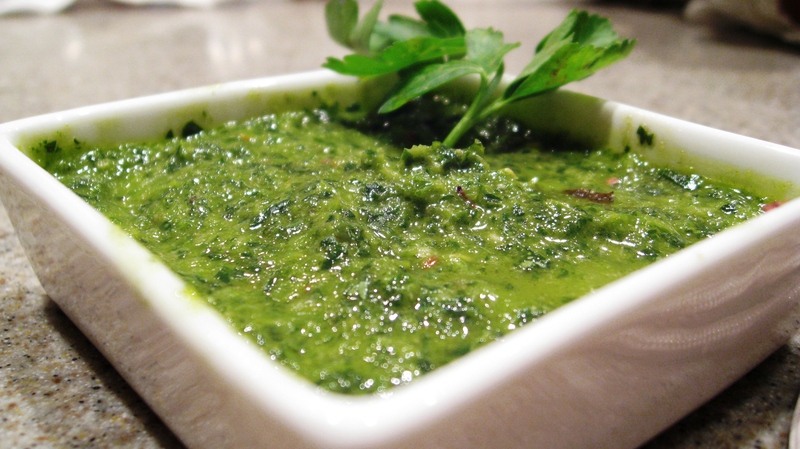 This Chimichurri is one of the best that I have tasted and will work great on steak, pork or really anything grilled. Looks DELICIOUS, Henry!!! I AM IMPRESSED… & can’t wait to try some myself! It’s DELISH!!!! Had it last night!!! Just made this in my Vitamix. YUM, YUM, YUM!!!!! Going to serve it with wild black cod fillets tonight. this looks so good and i’m going to make it really soon :)… i’m a member of ihatecilantro.com, but i have been trying so hard lately (eating it by the handfulls and such) to learn to love it. it’s the only food that i don’t like and i don’t understand why i don’t like it but to me it tastes like soap. ever had your parents wash your mouth with soap? reminds me of that just a little though, i mean if it really tasted like soap i couldn’t eat it by the handfulls! you understand. How long will this stay in the refrigerator?